Disclaimer: A SAP is not employed by, nor has any employment affiliation with the Department of Transportation. A SAP is NOT "certified", "accredited" or "credentialed" by the Department of Transportation. A SAP goes through a specific training and examination process as outlined by 49 CFR Part 40 to prove knowledge and competency in the skills necessary to assist employees and employers regulated by 49 CFR part 40. This training and examination process is required by the Department of Transportation in order for an SAP to provide these specific and regulated services. It is important to understand that a SAP is not "credentialed", "accredited" or "certified" by the Department of Transportation. For more information on this matter please see section 281 of 49 CFR Part 40 (49 CFR Part 40.281) describing the requirements, training and examination requirements and responsibilities of a SAP, or see parts of this section on the right side of this page. 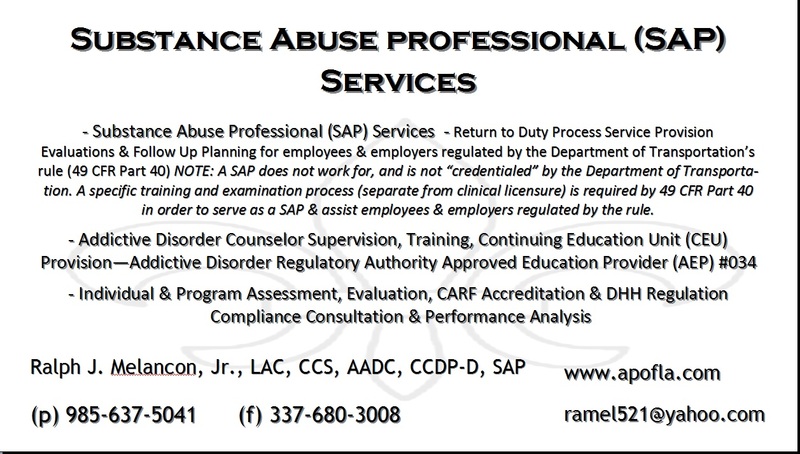 Our SAP (Substance Abuse Professional) mission is to provide the professional services necessary to aid in the successful implementation of the SAP Return to Duty Process to safety sensitive employers & employees regulated by the Department of Transportation’s rule, 49 CFR Part 40 "Procedures for Transportation Workplace Drug and Alcohol Testing Programs". We assist 49 CFR Part 40 regulated employees and employers with the successful completion of the Return-to-Duty and Safety Sensitive Functions process. *This information is meant as a quick reference to various important information and is not intended as a comprehensive list of all situations or expectations for employees covered under 49 CFR Part 40. 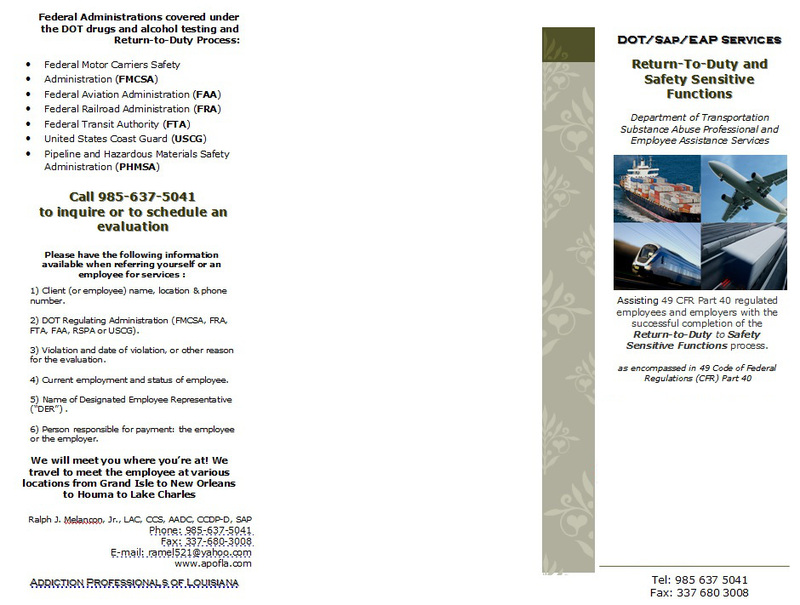 For complete information refer to Federal Register Part II, Department of Transportation (DOT) 49 CFR Part 40. The SAP must provide a comprehensive face-to-face assessment and clinical evaluation to determine what assistance, if any, the employee needs in resolving problems associated with prohibited drug use or alcohol misuse. Even though there is not a significant alcohol or drug problem or you just failed to show up at the test site. You will still have to complete some type of education. The SAP must recommend a treatment or rehabilitation program as necessary and monitor the individual’s progress through the treatment program. The SAP must determine when the individual has successfully completed the recommended treatment program through a face-to-face follow-up for compliance session and when they are ready to return to safety-sensitive duties. The essential and primary function of the SAP is Public Safety. All clinical work and SAP recommendations for treatment or education are made in the interest of public safety. (6) You are a drug and alcohol counselor certified by the National Association of Alcoholism and Drug Abuse Counselors Certification Commission (NAADAC); or by the International Certification Reciprocity Consortium/Alcohol and Other Drug Abuse (ICRC); or by the National Board for Certified Counselors, Inc. and Affiliates/Master Addictions Counselor (NBCC). A SAP is required to be knowledgeable about this part, the DOT agency regulations applicable to the employers for whom you evaluate employees, and the DOT SAP Guidelines, and you keep current on any changes to these materials. c) Qualification training. You must receive qualification training meeting the requirements of this paragraph (c). (ix) Issues that SAPs confront in carrying out their duties under the program. (2) Following your completion of qualification training under paragraph (c)(1) of this section, you must satisfactorily complete an examination administered by a nationally-recognized professional or training organization. The examination must comprehensively cover all the elements of qualification training listed in paragraph (c)(1) of this section. In the late 1980's, the Office of Drug and Alcohol Policy and Compliance (ODAPC) was established to advise the Secretary & DOT Agencies on drug enforcement and drug testing issues. As a result of the 1991 Omnibus Transportation Employee Testing Act, ODAPC's role was expanded, and today, employers in aviation, trucking, railroad, transit, pipeline and maritime industries are covered by ODAPC regulations. The U.S. Department of Transportation's (DOT) primary safety objective regarding substance abuse is to prevent alcohol and other controlled substance abusers from performing transportation safety sensitive functions. To assist in the process, the substance abuse professional (SAP) is charged with duties important to the evaluation, referral and treatment of employees identified as being positive for alcohol and/or controlled substances or who have refused to be tested. Why is a SAP required? 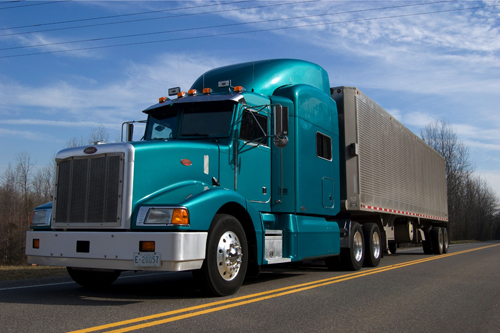 Any employee regulated by 49 CFR part 40 who violates these regulations must be immediately removed from safety-sensitive functions, and may not be returned to any safety sensitive functions in the transportation industry until the DOT return-to-duty process is successfully completed. When can an employee return to safety sensitive duties? An employee who has violated one or more of the DOT regulations must receive a follow-up evaluation by the original SAP evaluator to be considered for return to duty status. If the evaluator finds him in compliance with the treatment recommendations and deems him appropriate for consideration for safety sensitive duty, a recommendation may be made to the employer for consideration. This recommendation only recommends that the employee has been found to be eligible for the employer to preform a Return-to-Duty Drug Test for the purspose of determining readiness for a return to safety sensitive duty. The SAP in no way recommends a return to employment which can only be decided by an employer. Must employers give SAP referrals to applicants that test positive? Yes, the DOT regulations mandate that employers provide a SAP referral to any employee performing duties in a safety sensitive position that test positive or violate the regulations. 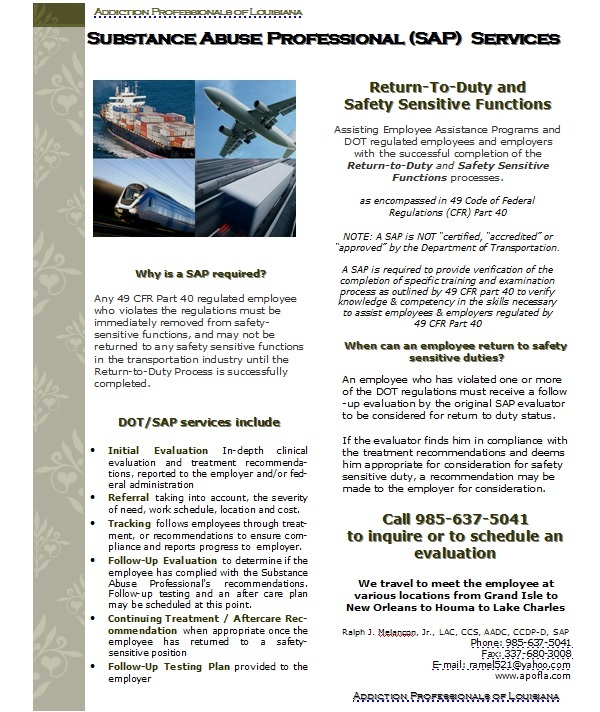 Note: An employee who has not successfully complied with the SAP's recommendation may not return to safety-sensitive functions for any DOT employer until the SAP's recommendations have been fully met and the employee is able to provide a negative return-to-duty test. Click the above link to go to the Office of Drug & Alcohol Policy & Compliance; The Department of Transportation’s (DOT) rule, 49 CFR Part 40, describes required procedures for conducting workplace drug and alcohol testing for the Federally regulated transportation industry. Note: Substance abuse treatment (outpatient or inpatient) will ONLY be recommended if it is indicated and needed as determined by professional evaluative instruments and guidelines such as the ASAM PPC2 Criteria and DSM 5 severity scales. If treatment is not needed, then Drug/Alcohol Awareness education in the form of classes, counseling sessions and/or 12 step recovery meeting attendence will be more than likely required. Initial Evaluation: In-depth clinical evaluation and treatment recommendations, reported to the employer and/or federal administration. Referral: taking into account, the severity of need, work schedule, location and cost. Tracking: follows employees through treatment, or recommendations to ensure compliance and reports progress to employer. Follow-Up Evaluation: to determine if the employee has complied with the Substance Abuse Professional's recommendations. Follow-up testing and an after care plan may be scheduled at this point. Continuing Treatment / Aftercare Recommendation: when appropriate once the employee has returned to a safety-sensitive position. Follow-Up Testing Plan: provided to the employer. Note: As defnied and regulated in 49 CFR Part 40, the Follow-Up Testing Plan is provided to the employer, cannot be released to the employee and is implemented by the employer AFTER the employee is cleared by the SAP and returns to safety sensitive duty. 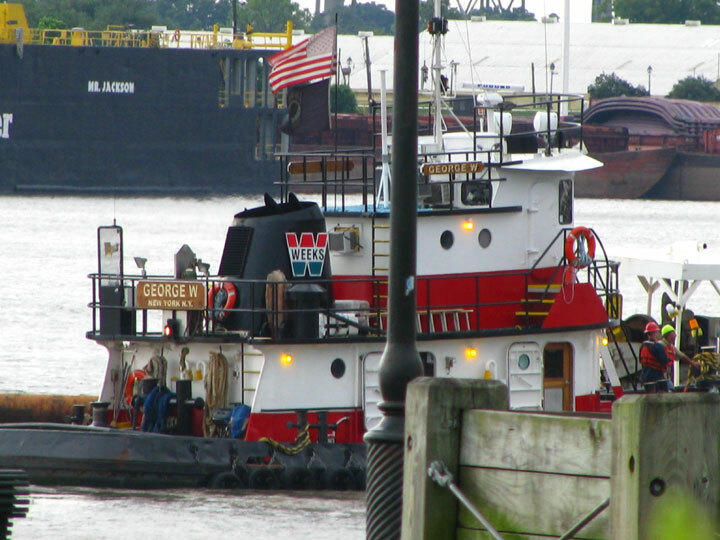 Providing (SAP) Return-to-Duty Services to employers & employees who are working or seeking employment in the Federally Regulated Transit, USCG Merchant Marine & Marine Services, Trucking, Towing, Aviation, Railway, Safety, Oilfield, Fabrications and Offshore industries. Serving ALL of Acadiana & South Louisiana. 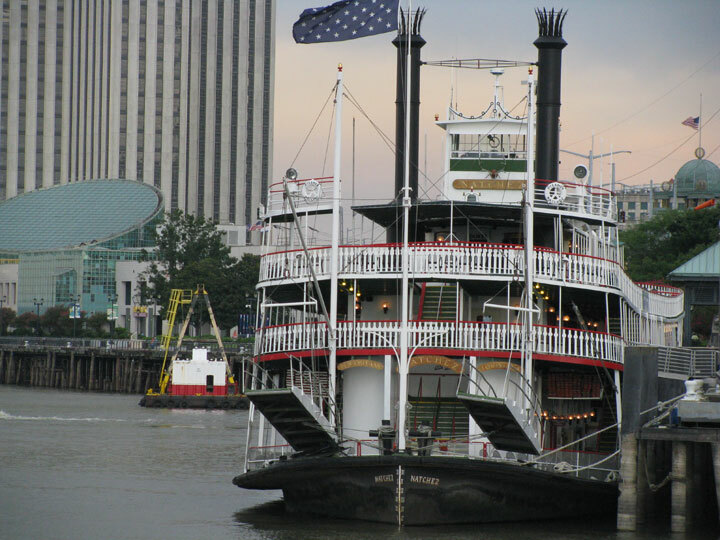 We travel to work with clients in and around most parishes and cities in South Louisiana, including Coastal Louisiana and Industrial Plants along the Mississippi River. What is the Return-to-Duty Process? DOT’s return-to-duty process is explained here. The process itself can be lengthy and involved if ongoing treatment for substance abuse is indicated. An employee who has been removed from duty because of a violation must successfully complete this process before he/she can be considered for return to duty or be hired by a different DOT-covered employer. When is the Return-to-Duty Process necessary? Federal Department of Transportation Alcohol and Drug Testing Rules: Department of Transportation regulations require that any safety-sensitive individual who refuses a test can not provide the specimen in a timely manner, tests positive for drugs, or has a breath alcohol concentration of 0.04 or greater must be immediately removed from duty and referred to a Substance Abuse Professional (SAP). A positive test is a violation. 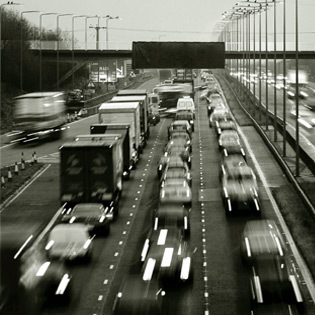 A refusal to be tested is also a violation, as well as number of other things that are prohibited by DOT. For a full explanation of DOT rules and regulations, please visit their website. When an employee has a positive test or refuses to be tested or has one of the other violations, DOT requires the employer to immediately remove that employee from safety-sensitive functions. An employer who allows an employee with a violation to continue performing safety-sensitive functions is subject to fines of up to $10,000 per day. An employee who has a violation has two options. He/she can find another job, outside of the transportation industry. He/she can be considered for returning to safety-sensitive functions in the transportation industry, but only after successfully completing DOT’s return-to-duty process, and then providing a negative result on a return-to-duty drug and/or alcohol testing. The return-to-duty process requires involvement of a qualified and trained Substance Abuse Professional, or a SAP. Face-to-face initial clinical evaluation of the employee. SAP sends report to the employer, specifying the SAP's recommendation for treatment and/or education. The SAP monitors the employee’s progress in the recommended program of treatment and/or education. When the SAP feels that the employee has made sufficient progress, the SAP will schedule a follow-up evaluation for the employee. - If the SAP reports that the employee has not successfully complied with the recommendation, the employer cannot return to the employee to safety-sensitive functions.